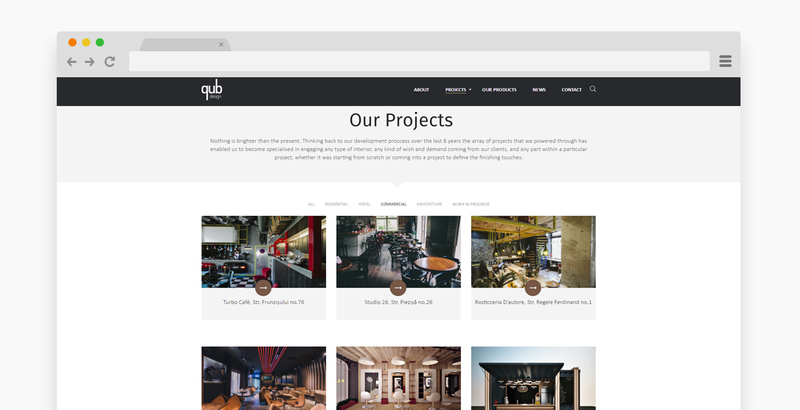 Atelier Qub Design is the passionate project of an experienced interior designer who brought together an awesome team of designers, architects, developers, and photographers. Since 2008, there’s no project they cannot handle, be it residential, commercial, architectural or hotels and resorts related. Here’s how we helped Atelier Qub Design develop a website worthy of their impeccable services, from the deep architectural infrastructure to the glowing surface design. For their website, we had to bring under the spotlights their most representative artworks. While working with so many high-quality images, we also had to build a modern design and develop a personalized structure, constantly filling the dots between projects and services. Our strategy was to display their portfolio and their own products within two different but interconnected website sections. 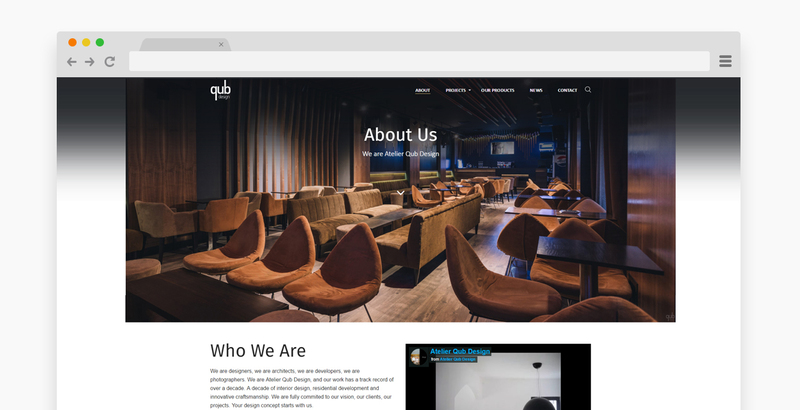 For this purpose, our designers and developers showcased their works through personalized tabs inside the Portfolio page, the Qub Design team providing us with details on the products that they develop and use with different other projects. 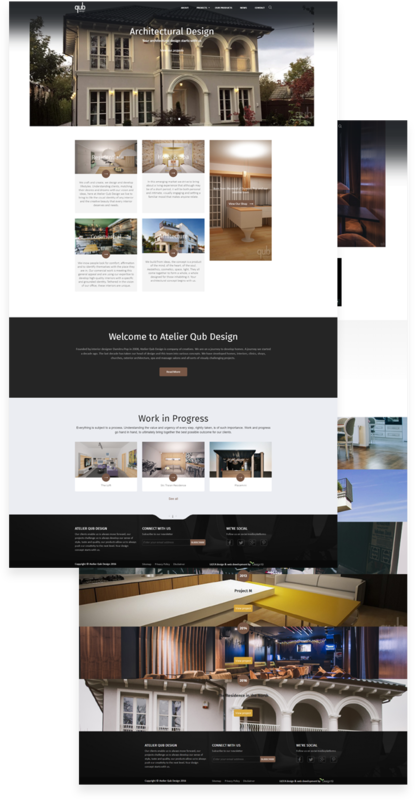 We have built the Atelier Qub Design website in WordPress, juggling with lots of custom features. 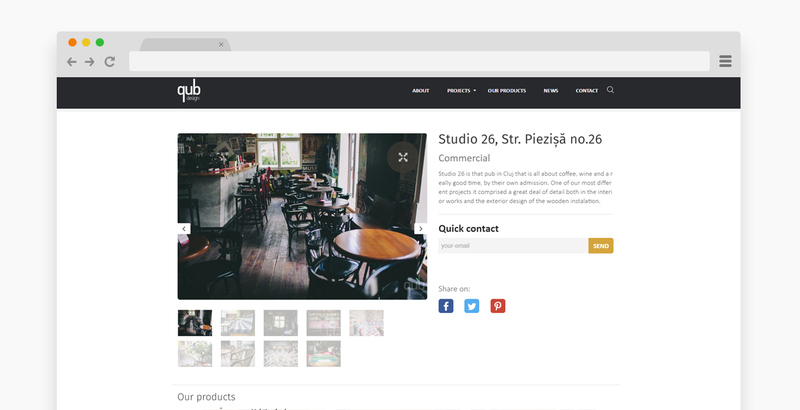 Particularly for their Portfolio, our developers created a custom WordPress module that would allow visitors to view photos in the full-screen mode. Their professional rendering and high-quality photographs couldn’t be better emphasized than through this special view mode. Another part of this project that required special attention during the development and design stages was the About Us section, where we focused on creating a visual timeline that will shout the greatness of their work from the rooftops: colorful, overview images with their representative projects, labeled by years, to reflect their evolution even clearer. Last but not least, we have tweaked their bespoke theme to allow instant order placements for their personal products. That way we gave this presentation website a more practical note, allowing everyone interested to directly purchase not just the services, but also the products carrying Qub Design’s signature. 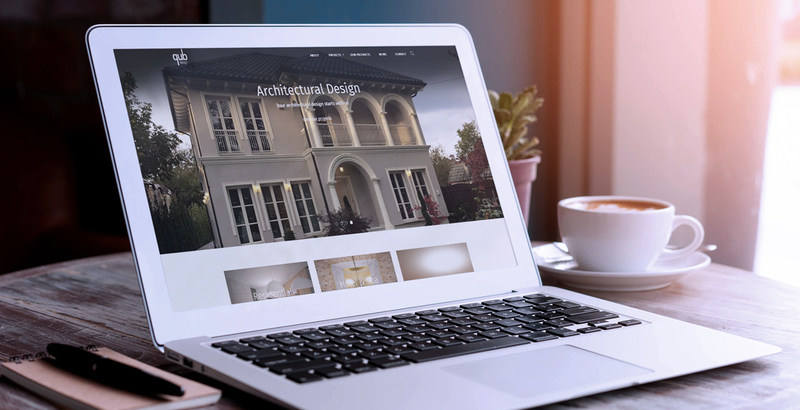 Building a website for such a competitive architectural design company challenged us to match the structure and the design to their style, taste, and quality. Just as Atelier Qub Design strives, we pushed our creativity to the next level, and results didn’t take long before reflecting on their online business presence. Discover our professional and personalized service!